If you’ve been meaning to try out some of Tampa Bay’s best restaurants, mark your calendars, a great opportunity is just around the corner. 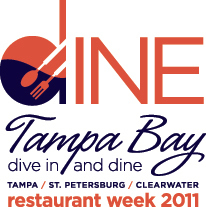 The 2011 annual DINE Tampa Bay Restaurant Week will take place August 19-September 2 offering diners specially priced three-course meals at some of the area’s beat restaurants, with participants including Brandon’s own GrillSmith and a wide variety of cuisines from fondue to sushi from downtown Tampa to the Pinellas County beaches. In addition to their standard fare, each participating restaurant will provide a special Restaurant Week menu which will suggest three options for each course. The special menu will offer $25, $35 or $45 prix-fixe, three-course menus (appetizer, entrée and dessert) throughout the week. Prices are per person and exclude beverages, tax and gratuities. Valrico resident Shannon Carlton attended the DINE Tampa Bay launch party recently and is looking forward to taking advantage of special offers to try some new spots during restaurant week. Presented by Tampa Bay & Company and the Florida Restaurant & Lodging Association, DINE Tampa Bay, has been designed to stimulate business and introduce new customers to restaurants located throughout the Tampa Bay area. For more information, add “DINE Tampa Bay” on facebook, visit www.dinetampabay.com or call Tampa Bay & Company at 223-1111.